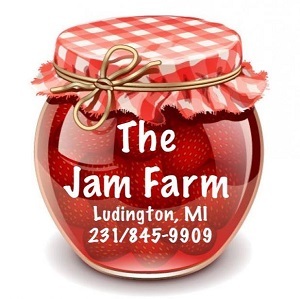 The Jam Farm, located less than a mile away from Lake Michigan in Ludington, is the place to get all the best jams, jellies, butters, marmalades, and other homemade goodies! 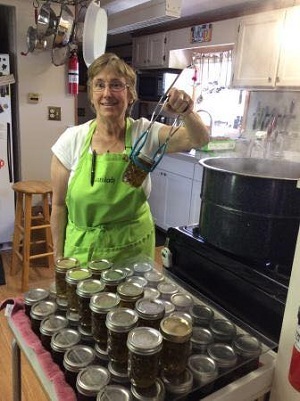 In season, Jamlady Lois Gieleghem makes jam almost all day, everyday. She's always busy around the Jam Farm, coming up with new recipes and keeping her delicious homemade jams in stock. The Jamlady uses heirloom recipes passed down through the family. Only the finest, freshest ingredients are used...no artificial flavors, colors, or chemical preservatives. All the fruit used in the jam recipes are fresh, local, and in season. "From farmers fields and orchards, to our kitchen, to you." The Jam Farm Offers Over 50 Flavors of Homemade Jams & Butters! The Jamlady is always busy, keeping her shelves full of over 50 different delicious flavors of her homemade condiments. Depending on the season, some jams may not be available if they have sold out, until that fruit season comes around again. Come by when the Jamlady is cooking and you can ask for a sample! Some of her recipes include: Black Cap Raspberry Jam, Black Cherry Marmalade, Black & Blue Jam, Blueberry Jam, Blueberry Lemonade (the Jamlady's favorite), Bumbleberry, Caramel Apple Jam, Cherry Pie Jam (the Jamdude's favorite), Cherry Rhubarb, Chocolate Raspberry Topping, Concord Grape, Elderberry Jam, Fresh Peach Jam, Pear Jam, Red Raspberry Jam, Red Onion Marmalade, Rhubarb Ginger Jam, Strawberry Jam, Strawberry Rhubarb Jam, Strawberry Marmalade, Stone Fruit, Strawberry Margarita, Sweet Black Cherry Jam, Triple Berry Jam, and Wild Blackberry Jam. Some sweet & savory flavors to transform everyday recipes into something more exciting include: Cherry Pepper, Jalapeno Pepper Jelly, Peach-A-Peno, Orange Chili Marmalade, Raspberry Chipolte, and Blazing Blueberry. Enjoy homemade granola, bread & dip mixes, and more! Not only does the Jam Farm offer delicious jams and jellies, but there are also many other homemade treats to try. Be sure to ask about Grandma's Bread Mix and Dip Mixes. Do you have a family or friends get-together soon? Or maybe a potluck coming up? Grab some different dip mixes from the Jam Farm store and your guests will be begging to know what the recipe is! The bread and dip mixes are so easy to make, anyone can do it! The Jamlady's homemade granola makes a perfect healthy snack, or include some in a Jam Farm gift basket! 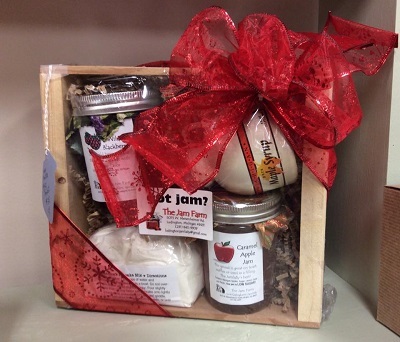 A Jam Farm gift basket makes the perfect gift for anyone! If you're looking for the perfect hostess, birthday, or holiday gift, look no further than the Jam Farm! The Jamlady creates beautiful gift baskets with an assortment of goodies you can choose from, or purchase an already made gift basket! Not sure what to fill it with? Just browse the Jam Farm store, which is recently expanded and renovated, and choose different items you want to include! You can also find quality local honey and Maple syrup at the Jam Farm store. The Jamdude makes beautiful hand-turned maple rolling pins...they make baking so much easier! He also makes oriole bird feeders...very attractive for the yard! There are so many great gift giving options available at the Jam Farm, all homemade by the Jamlady or Jamdude! 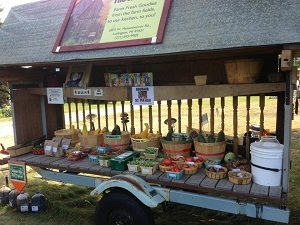 Visit the Jamdude's Farm Stand...Fresh Produce Right From the Jam Farm! Don't visit the Jam Farm without taking a look at the Jamdude's beautiful, fresh-picked produce! He grows everything himself right on the farm, and picks it fresh everyday! The produce on the stand depends on the season, but some of the produce he has grown throughout the year include rhubarb, asparagus, tomatoes, cherry tomatoes, carrots, cucumbers, beans, strawberries, sweet corn, potatoes, sunflowers, squash, zucchini, cherries, sugar snap peas, snow peas, and so much more! The Jam Farm has so much to offer, and it's a beautiful, short drive in the country. Bring the whole family...the Jam Farm is a great experience for kids young and old. At the Jam Farm, you'll also find a gorgeous painted quilt, "Michigan Beauty" on the side of the barn, as it's one of many stops on the Mason County Barn Quit Trail! If you're from out of town or out of state, take home some homemade Michigan jam...something you'll want to get every time you're back in the area! Some of the Jamlady's products can also be found at Chef John's restaurant and Shop N' Save, both in Ludington. If the farmer's market isn't going on when you want some fresh, local produce, then stop at the Jam Farm for your fill of just-picked fruits and veggies! There's always something going on at the Jam Farm! Stop by the Jam Farm soon, to savor the best homemade jams and jellies in the area. The Jamlady's mission is to "Make Your Life Sweeter, One Jar at a Time!" Contact the JamLady at ludingtonjamlady@gmail.com with questions and order inquiries.